Speed Dueling, the perfect introduction to the Yu-Gi-Oh! TRADING CARD GAME! 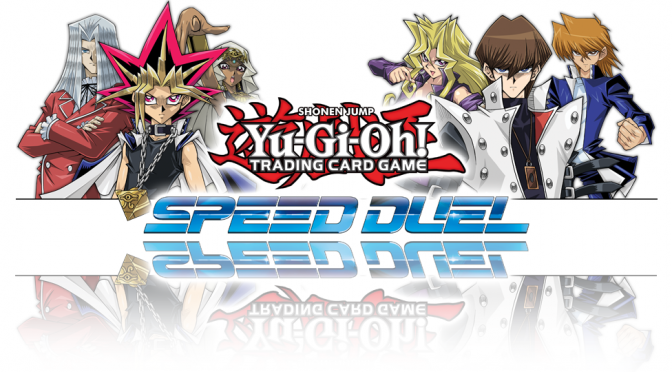 Speed Dueling is easy to learn, and is based on the ruleset found in the Yu-Gi-Oh! Duel Links video game. 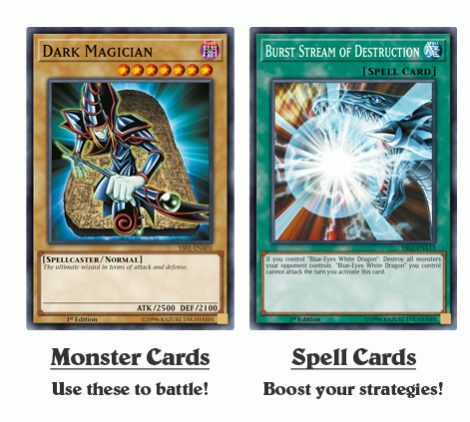 Whether this is your first time playing a physical card game, or you’re looking to take your Duel Links knowledge to the real world, Speed Dueling is your gateway to the world of Yu-Gi-Oh! Speed Dueling is a specialized version of the Yu-Gi-Oh! TRADING CARD GAME. Speed Dueling features 4 basic card types: Monster Cards, Spell Cards, Trap Cards and Skill Cards. The goal is to Summon powerful monsters, power them up with Spell or Trap Cards, and battle your opponent. 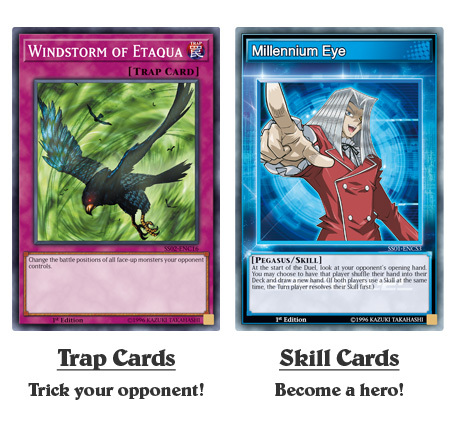 Skill Cards let you become your favorite Yu-Gi-Oh! character, and give you special abilities to use in your Duels! Both players start with 4,000 Life Points. Reduce your opponent’s Life Points to 0 to win the Duel! 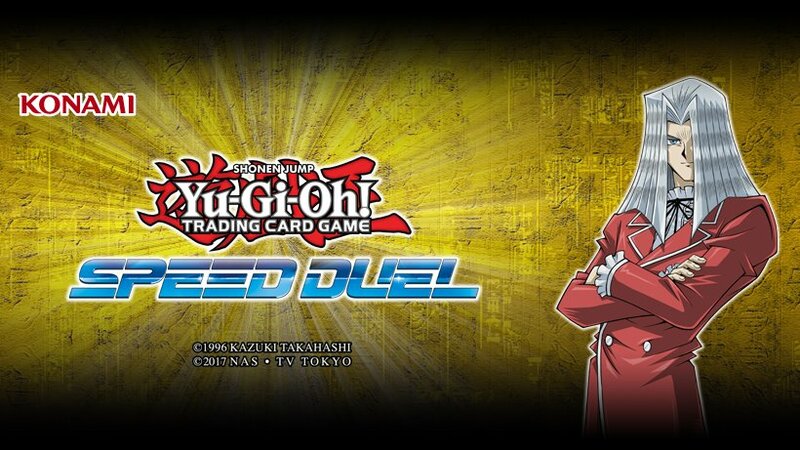 You will find a Dueling Guide in the Speed Duel Starter Decks. This will teach you the basics of how to play. You can also view the guide here. STANDARD RULES FOR SPEED DUELING! Each player begins with 4000 LP (Life Points). If your LP hit zero, you lose! If you have Fusion Monsters (purple cards), like Thousand Dragon, place them in the Extra Deck zone. Your Deck needs to contain between 20 and 30 cards. Your Extra Deck, if you have any Fusion Monsters, can be between 0 and 5 cards. Shuffle the cards in your Deck together before the Duel (but not your Extra Deck). You can’t have more than 3 copies of the same card in your Deck. Each player chooses 1 Skill Card before the Duel and places it face-down in front of them. Flip a coin at the start. The winner gets to choose to go first or second. If you go first, don’t draw a card on your first turn. Each player draws the top 4 cards from their Deck for their starting hand. The Duel is played in turns. At the start of your turn, draw a card. Then you can Set Traps, play Spells, and Summon a monster, in any order. After all that, you can attack. When you are done attacking, your turn ends, and now it’s your opponent’s turn. During your turn, you can Normal Summon 1 monster from your hand, in Attack Position (upright), or Set 1 monster facedown in Defense Position (sideways). Count the monster’s Level Stars when you Summon it. If it has 4 or less Level Stars, then you can just Summon or Set it. If it has more than 4 Stars, you need to Tribute a monster you already have in play first, by sending it to the Graveyard. You need to Tribute 1 monster to Summon or Set a Level 5 or 6 monster, or Tribute 2 monsters to Summon or Set a Level 7 or higher monster. If a card effect says to Special Summon a monster, you don’t need to Tribute unless the card effect says to. Also, Special Summons are “free” so they don’t take up your 1 regular Normal Summon/Set during your turn, and can even sometimes be done during your opponent’s turn! except by using the Spell explained on the monster. You can play Spells right from your hand to the Spell & Trap Zone. Just follow the card directions. If it’s a Field Spell, place it in the Field Zone. If a Spell or Trap has an Equip or Continuous symbol, it stays in play in the Spell & Trap Zone. All other Spells and Traps go to the Graveyard after you do what the card says. Traps are not played face-up during your turn. Instead, you Set Traps face-down in your turn. Then on any turn after that (yours OR your opponent’s turn), you can flip them face-up and use their effect, then send them to the Graveyard. This lets you do a surprise move! Each of your Attack Position monsters can attack once per turn. Pick a monster for it to attack, or if your opponent has no monsters, you can attack their LP directly. Subtract your monster’s ATK points from your opponent’s LP. If you battle an opponent’s monster, refer to the chart on the right to see what happens! If you attack a face-down monster, flip it face-up, and if it survives the battle, it stays face-up. Players of all ages and skill levels can compete together in tournaments to make new friends, see new cards and show off their best strategies. There’s no better way to experience the Yu-Gi-Oh! TRADING CARD GAME than to compete in events and Duel with your friends! There are Yu-Gi-Oh! TCG events for every type of Duelist, from small tournaments in your local store to massive international events where the top Duelists from around the world play for big prizes. No matter which type of tournament you play in, you will always get prizes for taking part; nobody goes home empty-handed after a Yu-Gi-Oh! TCG event! Duel with your friends at our Official Tournament Stores! Official Tournament Stores regularly host Yu-Gi-Oh! TRADING CARD GAME events where you can win prizes! 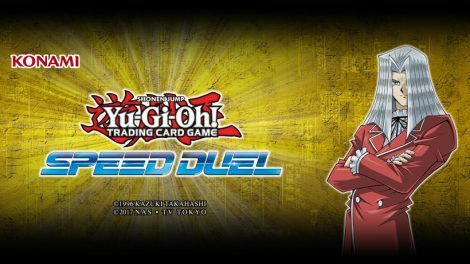 Speed Duel OFFICIAL Tournament Stores List – USA and UK Official Tournament Stores. Be sure to check with your local store if they offer Speed Dueling tournaments. 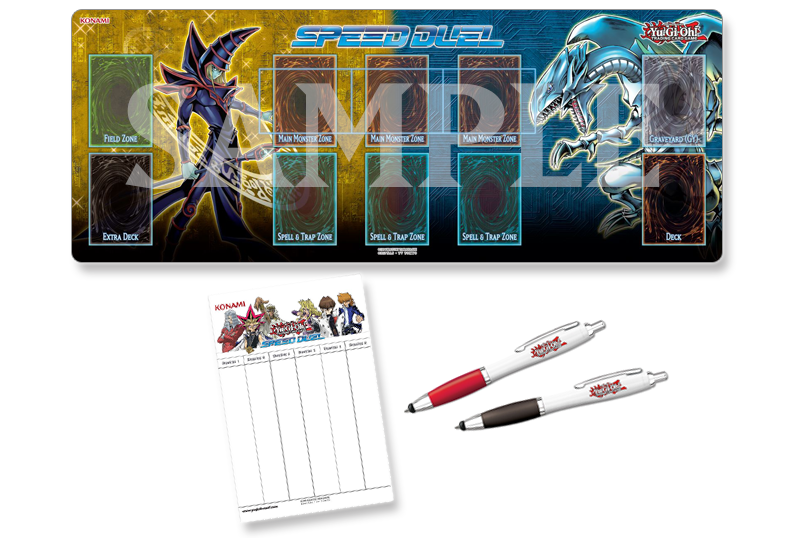 EU/UK check the tables below for special Speed Dueling events!